I had some hopes for fresh thinking due to the “outsider appointment” status of the Bank of England’s new’ish Deputy Governor for Monetary Policy Ben Broadbent. He wasn’t part of the clique around Mervyn King and the long-serving staffers like Paul Tucker the previous Deputy Governor who so messed up UK monetary policy in 2007-09. His latest speech shows him falling into the very messy and confusing place, where central bankers love to be Kings of Discretion rather than Rule Abiding Good Citizens. He is so busy patting himself and his colleagues on the back for ignoring above target CPI in 2011-13 that he can’t see the damage he is causing and about to cause today. But he starts of by setting himself a pointless problem and then digs an enormous hole as an answer, partially digs himself out but then proves when you are in a hole you should stop digging. The previous Governor of the Bank, Mervyn King, once referred to what he called the “rich seam” of MPC communication. Rich or not, it’s certainly a wide seam: MPC members each give several speeches a year; we publish minutes of every meeting, now supplemented with a Monetary Policy Summary; every quarter we publish a 50-page Inflation Report that summarises the MPC’s collective view of the economic outlook and includes our latest forecasts; every Report is followed by a session in front of parliament’s Treasury Committee. Yet, from all this, the outside world seems increasingly interested in only one particular nugget: the MPC’s central inflation forecast two years ahead. The answer is simple: the Monetary Policy Committee sets monetary policy based on their forecast of inflation two years away. Inflation is always said by the Governor and his colleagues to be on target or off target by this “medium term” forecast. Of course, we all watch the forecast, that’s the world the BoE has created. The idiotic thing is that the forecast depends on the ever-so-slightly-circular market-implied BoE interest rate forecast, as created itself by nods and winks from the BoE. The problem is that the “data” is very stubborn and near term inflation refuses to rise in line with the forecasts to allow the BoE to follow its desired rate normalisation path. This is because their simple Philips Curve model of the world is wrong. Some would like to see the model and the results it produces, but for Market Monetarists it wouldn’t tell us much we don’t already know about their “slack theory” of inflation. 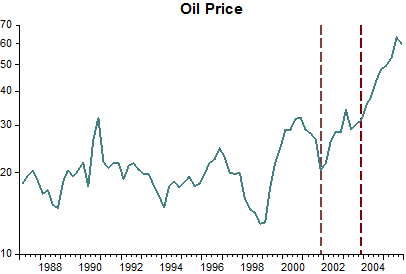 Slack being taken up does not lead to wage pressure and so does not lead to price pressure. 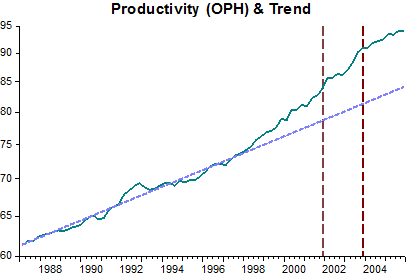 Aggregate Demand, or rather aggregate nominal spending, drives prices up and that pulls wages up. 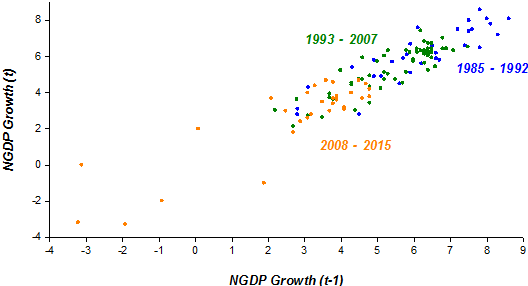 And aggregate nominal spending is set by NGDP growth expectations. For all Broadbent’s protestations of the BoE having a flexible inflation target, the market is a better prophet. The market can see the BoE’s obsession with the mid-point of its two-year out inflation forecast. But there really is no need to actually raise rates if the BoE is on target with its target as we said a few weeks ago. The market will anticipate the rises in rates and cool-off its expectations accordingly. This cooling-off acts as a break on nominal spending growth, in turn causing inflation to never rise as expected by the BoE. We are thus stuck in a self-defeating loop. “Long and variable lags” the standard cop out of today’s bankrupt monetary economists. Broadbent sets up three scenarios in the face of a “cost shock” sending inflation up by 2% to 4%. The second question he asks is how to get it down. Quickly. Slowly. Or, weirdly, “Drunkenly”? Actually, methods don’t matter, the fact that it must be brought down is all important. It’s not a flexible target, it’s still a 2% target. It is merely a flexible amount of time to bring it back to 2%. And it is gradually squeezing the life out of the recovery. It’s not too late to react, and the BoE probably will, just in time, but their reaction time is too slow. Shouldn’t the policy horizon simply be the shortest time delay between changes in interest rates and their impact on consumer prices? Well one problem is that one can’t be entirely sure about what that delay is. As a famous economist once said, monetary policy seems to operate with “long and variable” lags. It is funny how Milton Friedman is wheeled out repeatedly for this hoary old chestnut. He was really on to scare politicians and policymakers out of trying to fine-tune the economy. Friedman was probably just wrong on this point, as rational expectations theory has shown and the markets demonstrate day in day out by reacting immediately to unexpected changes in monetary policy, and to unexpected inaction in monetary policy to changes in the economic outlook. It is hard to see why it has gained status as a near religious truth. Interestingly, when Milton Friedman said lots of other things he gets ignored or ridiculed, especially by Keynesians when it comes to his supply-side views on economics. More importantly, he also said that often you can’t tell the stance of monetary policy by the level of interest rates. He also ridiculed the idea of cost-push inflation. I think this had real relevance at the time I joined the MPC, in mid-2011. At that time … After a tepid recovery there was still plenty of spare capacity in the economy. 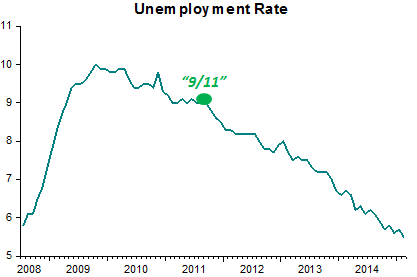 Companies said they were operating well below capacity; unemployment was still high. But thanks to a series of cost shocks, including the big depreciation of sterling’s exchange rate 2-3 years earlier, inflation was nonetheless well above target. In response, the MPC … took a more balanced approach. As I tried to explain in a speech I gave later that year, the MPC had arguably tolerated the (then) high rate of inflation for longer than it might have done because the real side of the economy was so weak. It signalled this choice more explicitly in early 2013. Following a further depreciation in the currency, rises in administered prices and the prospect of continued weak growth in productivity, inflation was thought “likely to remain above target for much of the forecast period”. But “attempting to bring inflation back to target sooner…would risk derailing the recovery” and it was therefore “judged appropriate to look through the temporary, albeit protracted, period of above-target inflation”. 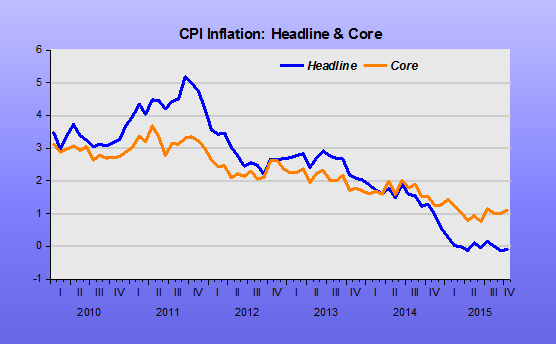 Was it so difficult in 2011 to look through headline CPI? 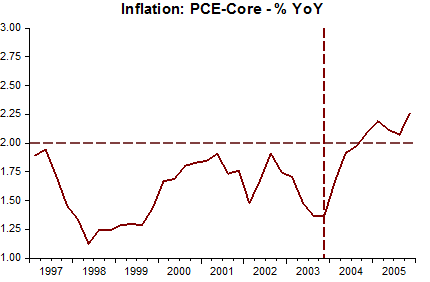 Look at core inflation back then. 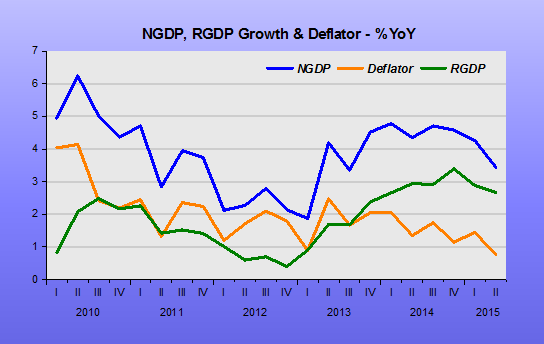 And the more appropriate measure to steer the economy, the GDP Deflator, was running at or below 2%. 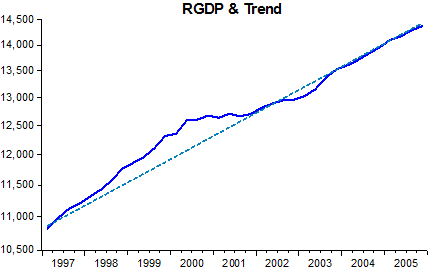 Of course, RGDP was certainly weak and falling. And the combination of the two, NGDP, was also weak and falling. In 2013, there was some modest recovery but we know how the BoE is currently squashing that with all its contractionary talk of rate rises sooner rather than later. Quoting Svensson only when it suits, but are they symmetrical? I don’t think this was so exceptional. There is no inflation-targeting monetary authority that behaves so rigidly as to attempt to offset all shorter-term shocks to inflation, no matter the effects on the variability of interest rates and output. As the economist Lars Svensson puts it, “in practice, inflation targeting is always ‘flexible’, because all inflation-targeting central banks not only aim at stabilizing inflation but also put some weight on stabilizing the real economy”. While it is great to see the magpie Broadbent quoting Svensson what would Svensson be saying right now about the UK? Is he saying that now the UK is near “full capacity” and there is no need to get inflation back to target? I don’t think so. I think he’d be warning of the dangers of Japanese-style deflation, not fussing about when the next rate rise would be like Carney, or teasing the market, Broadbent-style, about the way to read or not to read the BoE’s intentions. What is the BoE really up to? Well, actually, it appears to be trying to steer the real economy, and I’m not sure that’s their job or that it is possible. 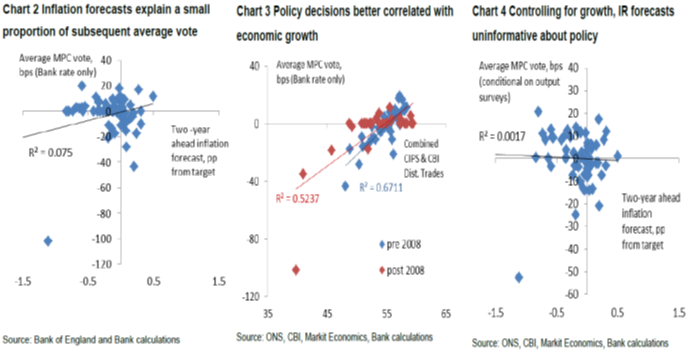 In three charts from his speech Broadbent shows the correlation between economic variables and average votes on the MPC to change rates. 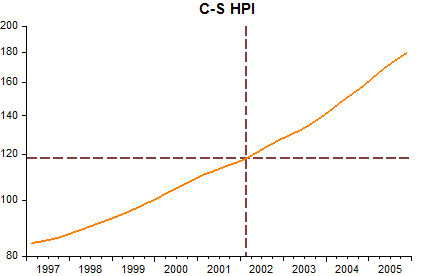 The strongest, in fact the only meaningful, correlation is with real economic variables (Chart 3). But the real economy is a residual between nominal growth and inflation. And that is not a central bank job as all textbooks and mission statements will tell you. 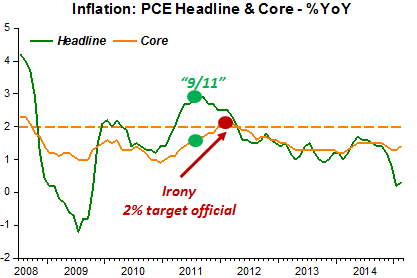 They are not trying to steer inflation (Chart 2). This is good, because that is very tricky trying to steer the residual between real and nominal growth, even though it is what they should be doing according to their mission statement. So, sort of bad, too. They are also not steering a form of NGDP (Chart 4, I think). This is bad as that is what they can actually steer, aggregate UK demand or nominal spending. And by not looking at NDGP they make big mistakes, causing instability in RGDP. They missed the rapidly declining NGDP in 2Q08 and appeared unconcerned by 3Q08, half-heartedly focusing, instead, on the banking crisis they had caused. Then, they are shamefully guilty of the four successive quarters of negative NGDP from 4q08 onwards with its appalling impact on RGDP, unemployment and lost growth. 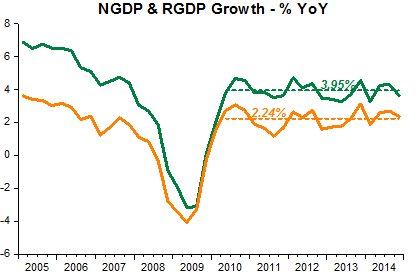 They need to pay attention now as NGDP shows a bad trend in the UK, declining to 3.4% in 2Q15 and looking lower again in 3Q15. Broadbent needs to wake up and stop this somewhat smart-alec self-congratulatory lecturing. Tony Yates tips his hat with more respect that in previous posts towards NGDP Targeting. 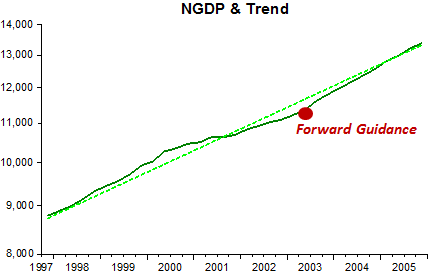 “NGDP targeting would not have helped avoid the financial crisis. That was caused not by bad monetary policy, but by bad financial regulation policy”. He was picked up on this by both Andy Harless and one other, but Yates kept mum. Why? I suspect he can’t go there because his long time at the Bank of England turned him into something of an apologist for his alma mater. Benjamin Cole has complained here about the same sort of thing in the US. He has to make it very clear that it wasn’t in the lower ranked parts of the central bank, inhabited by dumb financial regulators, who failed to control those smart but evil guys at the banks. But if it weren’t the banks or their regulators who caused the crisis then who was to blame? Yates and the all too numerous academics who move in, out and around the central banks have too much at stake to hold their hands up and take the blame. They can’t face the embarrassment. But it was them. And this is probably the reason we hear so little criticism of the Bank of England’s monetary policy or that of the Fed or the ECB in precipitating the 2008 and 2011 crises. They really are “all in it together”. And like any good trades union, united they stand divided they fall. Well paid bankers make easy villains yet the liquidity crisis that brought them low was a central bank failure. Yates pompously suggests Market Monetarists should stop writing and go and create some mathematical models, but if I were to put in a function for “catastrophic failure by central banks to stick to targeting core CPI and in fact actively tighten policy or threaten to do it in the face of falling NGDP expectations” how would that go down? I suspect I wouldn’t get much funding from Yates and his cronies who stuff the academic funding bodies or see it published in one of the hundreds of central bank academic journals. It may be wordy to call most modern macro a closed shop, but it’s true. If Yates can so easily toss off populist comments that it was all caused by evil commercial bankers and useless regulators then there is plenty to argue about over the internet. My last blog might have got a little carried away with analogies. The import might thus have been lost of my killer quote from what Yates called the “classic survey from 1999 … [where] … there has been a torrent of work since, reconfirming this basic message” of how monetary policy has to operate. 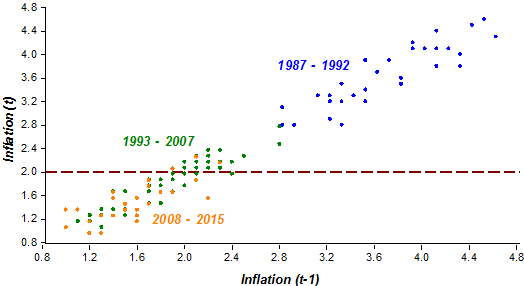 While this paper by Christiano, Eichenbaum and Evans does not support Yates view of long and variable lags view it also asserted the centrality of the growth rate of money as the central test of monetary policy. It’s funny but I had not really thought that this would have been controversial today. I thought it was just a statement of the bleedin’ obvious. What else is monetary policy other than the supply of money? It’s what a central bank does. Yet read Yates and there is no money supply in his model. Wierd or what? I was then musing worriedly like the rest of the world about just what the FOMC were really on about in the extensive minutes published of their July meeting. The ones that when published on August 19th triggered the latest global sell-off. They read just like any competent economic survey or macro investment report on the state of the economy. “On the one hand this, on the other hand that”, etc, etc, perhaps a bit overlong. Actually way too long. TBH I gave up and skimmed after the first two thousand words or so. But then I thought, hey, this is the supreme monetary authority of the world what do they say about the growth rate in the money supply, their key weapon in implementing monetary policy as stated by Yates’ “classic survey”. Well, I was not going to read the whole 8000 words when I have Acrobat’s word search function. My word search didn’t seem to work. There was no mention of the money supply. There were only two mentions of money at all, both as in “money market interest rates”. I tried “monetary conditions”, but no joy. “Monetary” came up frequently, as in the two “Deputy Directors of the Monetary Affairs Division” (plus one Assistant Director), the Division’s two Senior Advisers (plus one plain Adviser), one Associate Director (plus his deputy), one Project Manager, one Section Manager and, of course, their own Senior Economist. I guess if the actual Director had been there too the room might not have been big enough. “Monetary policy” came up a lot too – sadly mostly in the context of the “normalization” of it, and we know that only means one thing – tightening. I then had to re-skim the 8000 words to see if the discussion on monetary conditions or the money supply was somehow encoded elsewhere. But no, it wasn’t. Nothing. Nada. If anything monetary conditions, at a stretch, seemed to be associated with whatever the interest level was: a low rate means easy money, without actually looking at the growth rate of the money supply itself. It’s a sad thing that on the verge of a momentous policy decision to start actively tightening, sorry, normalizing, monetary policy there is no discussion or investigation whatsoever into actual monetary conditions. As I said, weird or what? Monetary policy has, of course, been actually tightening as the debate has heated up – witness the carnage in markets, and well, the zero growth in the money supply. Oh, and as you survey your stock market investments, don’t forget they tell you nothing about the effect of monetary policy, it only operates with long and variable lags. I am not a wonk, and barely an expert. This is a bit wonkish, but still worth reading for the non-expert. Mark Sadowski inspired it! In Tony Yates’ reply to my earlier post he cited two academic studies that would presumably show me that what financial markets know to be true, was in fact false. Yates and the “long and variable lags” brigades who flourish inside our central banks and elite universities remind me of quack doctors in the world before the discovery of the circulation of blood. They prescribe remedies for which they have no agreed scientific basis, but don’t really get tested because if the the patient recovers they win, if the patient dies it was because the disease was proven uncurable. We only find out the effects of their hit and miss cures at the end of the treatment. For anyone wanting a quick read on just what a mess modern, consensus, macroeconomics is in the Wikipedia entry on the standard paradigm. “New Keynesian” reads like a discussion between two competing schools of seventeenth century apothecaries. No-one has a clue, but they definitely know the other side is wrong. Modern doctors prescribe cures to which they generally know the results. Start this course of drugs now and in a certain period of time you will be cured. Setting the course is everything. If doctors didn’t know ibuprofen stopped most headaches they wouldn’t prescribe it. The long and variable lag from the taking the pill to the headache going is completely irrelevant. Put simply, monetary policy changes have to act quickly on money, on the money side of the economy itself (the MV bit of MV=PY). If it isn’t acting, or expected to act, it isn’t working. Market Monetarists say you can tell if it is working instantaneously by looking to see if the size of the money economy is expected to grow. Scott Sumner’s great contribution is to suggest a “money economy” growth futures market, or NGDP futures market. It would be the equivalent of all the best medical brains putting their money where their mouth was, or reputations on the line. Doctors in medicine do this today, everyday, by earning money through proven, successful treatments. Setting courses, more or less knowing the results – not much waiting around to watch the long and variable lags. They act with confidence in the outcomes of the courses they set. In the absence of futures markets we are forced have to use somewhat unsatisfactory substitutes like market forecasts of inflation (in the US TIPS spreads), or other forward-looking instruments like stock market indices and bond yields, or FX rates that incorporate the expectations of one currency’s inflation prospects vs another (amongst other things). The market’s reaction is the policy. When the market reacts to unexpected data points or new news in FOMC speeches, decisions, leaks, minutes, etc, then that tells us how the policy is changing. Immediately. Instantaneously. With no lag. Unexpected silences from the Fed in the face of big market moves can also be telling, as now. It is harder to interpret than unexpected news, but it is still there. Yates directed me to his own co-authored paper but it seems as weird as most modern macro in that it has no role for money. The equivalent of those quack doctors working without knowledge of the circulation of the blood. When writing about monetary policy with such authority as Yates and so many macroeconomists like him, the plain man would expect money to figure in their highly technical models of the economy, but it doesn’t. No wonder Yates and so many central banks like the Fed, the BoE, the ECB who use the same moneyless-model have proven so hopelessly wrong during the crisis. Their model is literally and metaphorically bankrupt due to the absence of the key measure of monetary policy, money or the money economy itself. “Too tight?” Sounds ridiculous when you listen to 99% of commentators and conventional economists or look at such “obvious” facts as ultra-low interest rates and all the QE, past and present. But why we should listen to conventional macroeconomists is anyone’s guess when they were so dismally useless in spotting the crisis in 2008. Never have so many experts been proved so lacking in expertise. Only a handful of got the story straight, most prominent was Scott Sumner, a professor at an obscure US college, but also a University of Chicago PhD in Economics. His version of monetarism, christened Market Monetarism was publicised on his blog. And, of course, Marcus Nunes here at Historinhas. Sumner spotted that nominal growth expectations were falling in 2007 as the housing market in the US and elsewhere came off the boil. Rather than stay committed to maintaining a smooth path of nominal growth, central bankers moved to a tightening bias for monetary policy dazzled by high headline inflation. Their actions, or rather their inactivity, turned stalling growth into a banking crisis and a recession. The confusion is caused because interest rates, QE and current monetary policy are trapped by the central banks’ love affair with Inflation Targeting. Markets are smart, they are forward-looking, expectations-driven. The “Market” in Market Monetarism. If the central bankers start fretting about inflation the markets know that rate rises and active monetary tightening is around the corner and respond by buying government bonds, buying the currency and selling equities – all in expectation that the monetary authorities will act sooner rather later. The reaction thus becomes the policy. The central bank action when it comes, if expected, is not accompanied by much market reaction. ‘Buy the rumour, sell the fact’, as any finance professional will tell you on day one. Hence, we have endless speculation about what the authorities are planning. And in times of stress or uncertainty about the economy, doubled and redoubled attention. The “taper tantrum” was a great example of this. We are probably having a second, “taper (or tightening) tantrum” right now. Many conventional macroeconomists still cling to the notion of “long and variable lags” before the impact of changes in monetary policy have an impact. One top UK economics prof even names his popular blog after it. They could not be more wrong. Markets do the heavy lifting, the signalling, the changed expectations, instantaneously. The rest is history, or rather the inevitable playing out of those expectations in terms of high or low inflation, or rather high or low nominal growth. Of course, expectations can change as central bankers shift their views but often they get stubborn, with disastrous consequences. What we are seeing now is the very long and slow recovery from the Great Recession being threatened precisely because that recovery finally appears to have gathered enough pace to see some modest nominal wage growth, partly due to unemployment having fallen to pre-recession lows. What both Market Monetarists and markets cannot grasp is why this should lead to active monetary tightening. All monetary theory says that you should tighten when nominal growth is too rapid, too far above trend. There is no conceivable data in the US or UK to show we are at above trend growth. Yet the very same central banks who so messed up in 2007-08 are on the verge of doing it again. Markets can see this and are reacting badly, correctly.